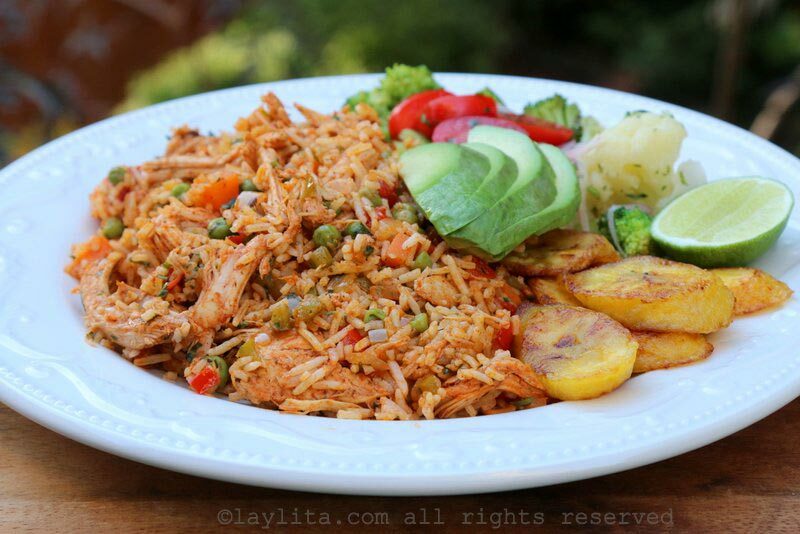 This is my super easy recipe for Latin style rice with chicken or turkey, also known as arroz con pollo o pavo. 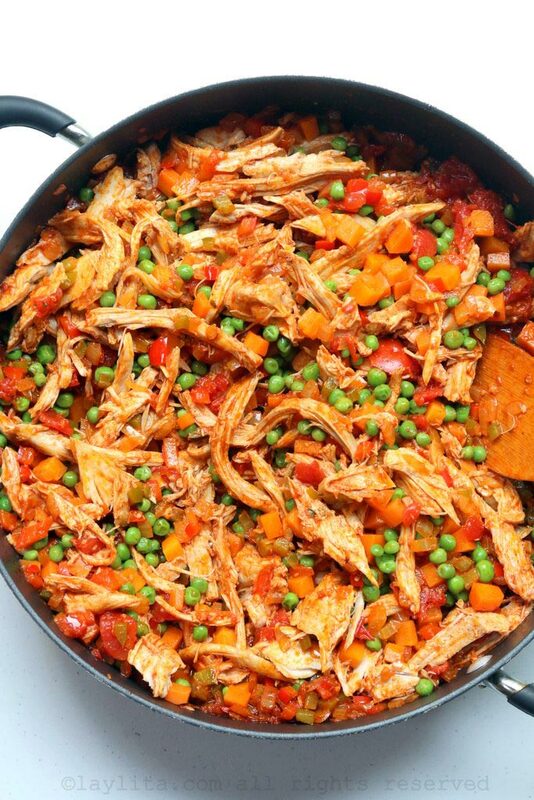 I prepared this arroz con pollo variation specifically as a way to use up any roasted chicken or turkey leftovers. 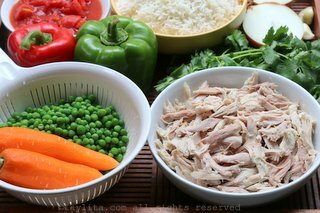 It’s a perfect way to transform those holiday turkey leftovers or even that store bought rotisserie chicken leftovers into a quick and tasty meal. 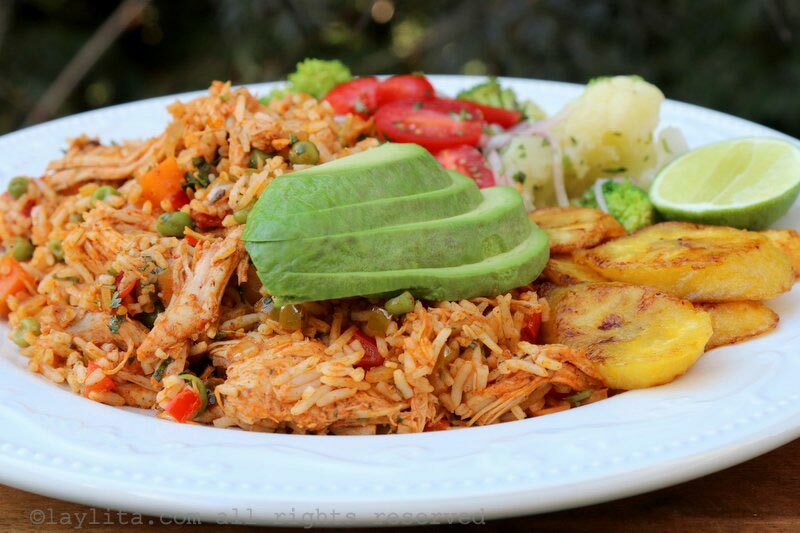 An easy recipe for Latin style rice with chicken or turkey, also known as arroz con pollo o pavo, to use up roasted chicken or turkey leftovers. 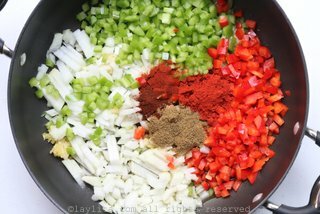 In a large sauté pan or frying pan, heat the olive oil over medium low heat and add the onions, garlic, bell peppers, achiote, cumin, chili powder, paprika, and oregano, cook for about 5-7 minutes or until the onions and peppers are soft. 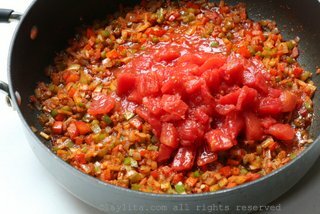 Add the tomatoes, mix well and cook for another 5 minutes. 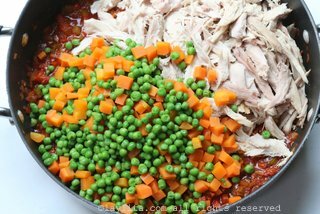 Add the cooked peas, carrots, and shredded turkey or chicken. Mix well and cook for a few minutes. Add the cooked rice, soy sauce, and turkey or chicken broth to taste. 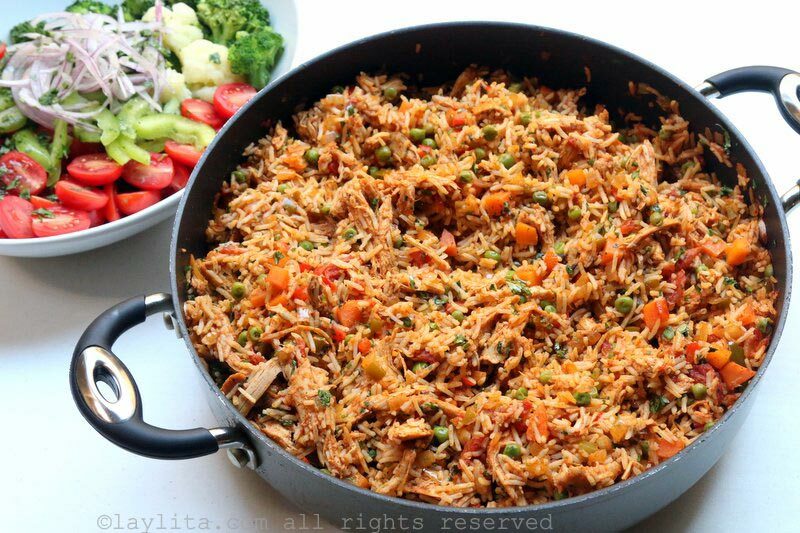 Stir well and cook for about 5-10 minutes. Taste and add salt and additional seasoning to taste. 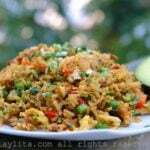 Stir in the finely chopped cilantro or parsley, and serve with fried ripe plantains, avocado slices and/or side salad. 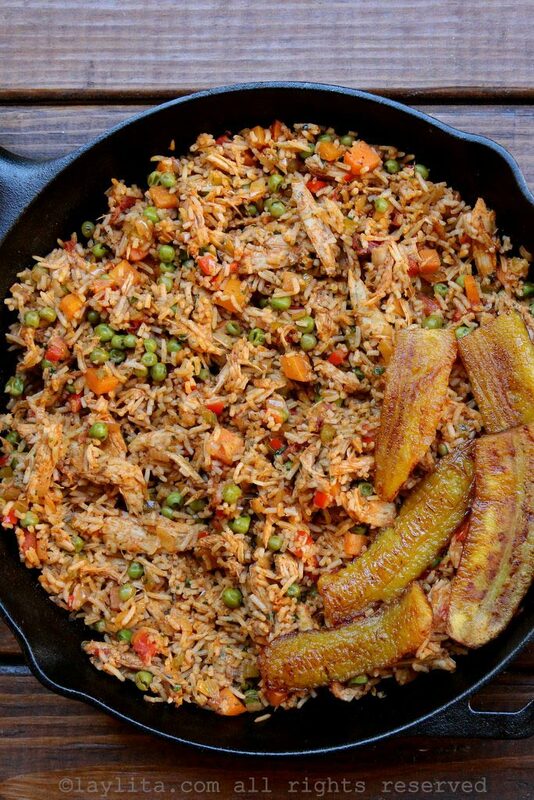 This Latin rice with chicken or turkey is very customizable – as dishes for using leftovers should be. 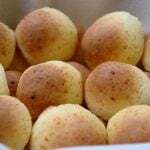 You can follow the recipe exactly or make adjustments based on what you have available or on what you like. 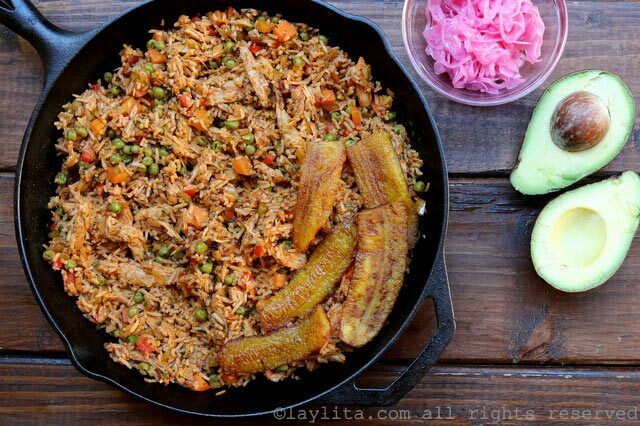 If you also have leftover pork or ham you can add some the dish, at the same as you are adding the chicken or turkey. Other ideas include adding olive slices or raisins, if you like that sweet and savory contrast. 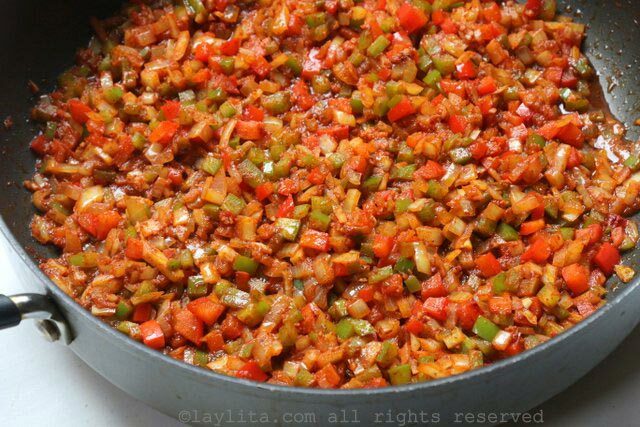 For a spicier version you can add chopped jalapenos or hot peppers at the beginning when you are making the refrito or sofrito with the onions, peppers and spices. I added peas and carrots to the chicken rice, but you could also add corn, green beans, chopped celery, green onions, and other veggies. I cooked the rice using my Latin/Ecuadorian method but used turkey broth instead of water, you can do the same, or use regular store bought chicken broth, or simply water. 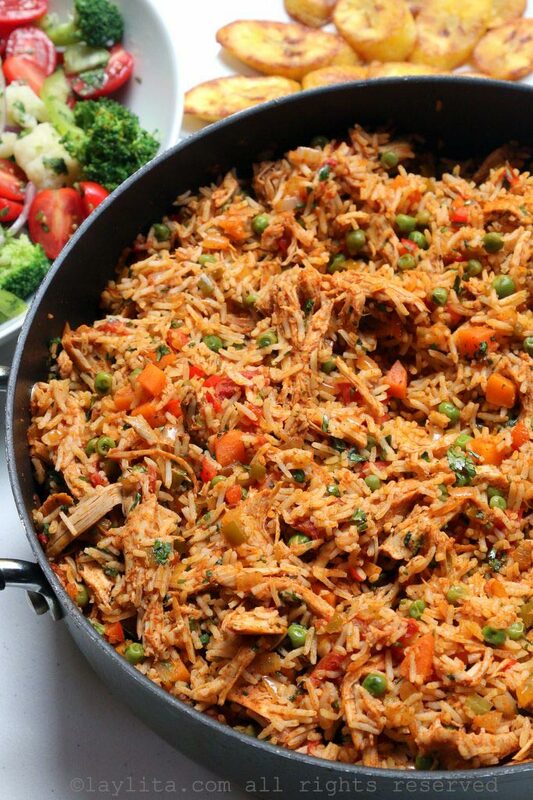 You can also replace the white rice with brown rice or with quinoa for healthier arroz con pollo variation. 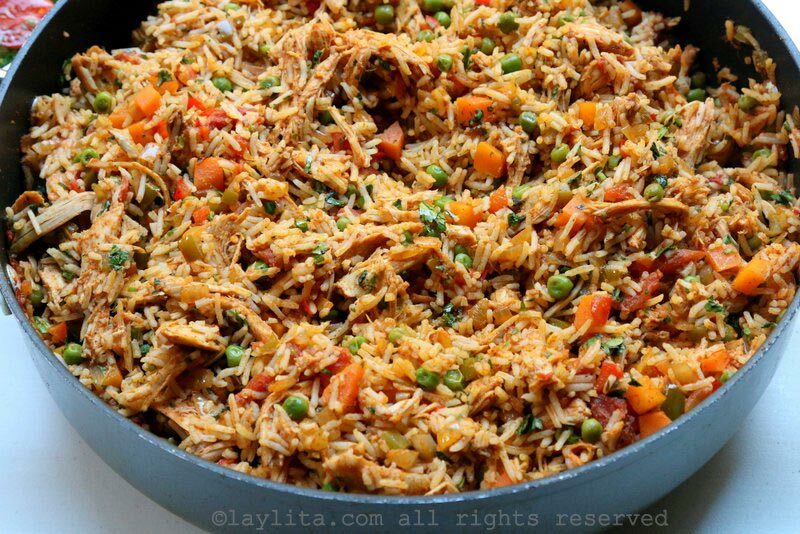 It goes without saying that even if you don’t have leftovers and are simply craving a good bowl of comforting arroz con pollo or rice with chicken, you can still make this recipe. 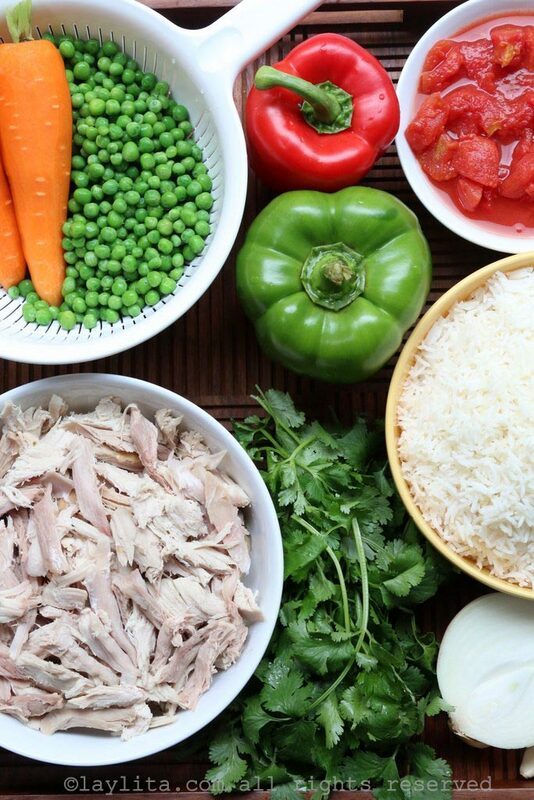 You can start from scratch with a whole chicken; boil it with some bay leaves, onions, carrots and peppercorns. Then debone it and the boil the bones even more to make a flavorful chicken broth. 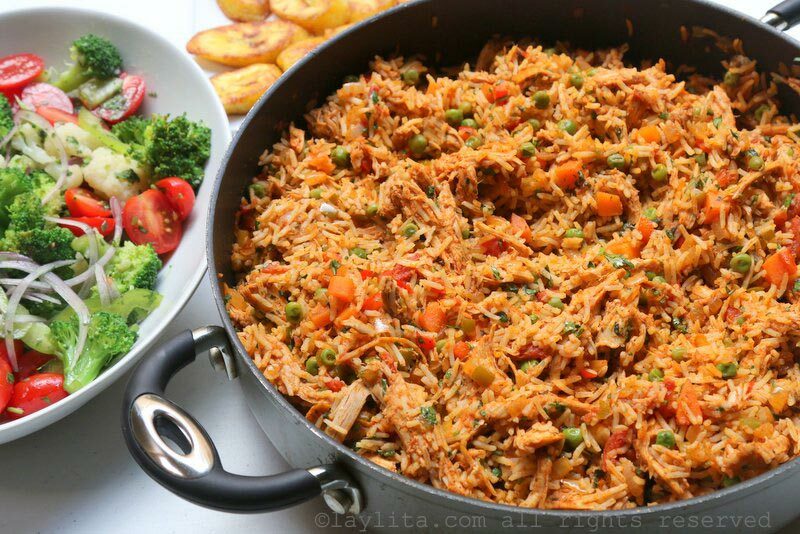 Use some of the broth to cook the rice and save the rest. Or you can take a shortcut and just use chicken breasts and/or boneless thighs, boil them, and shred the meat. Either way it will be a delicious meal. 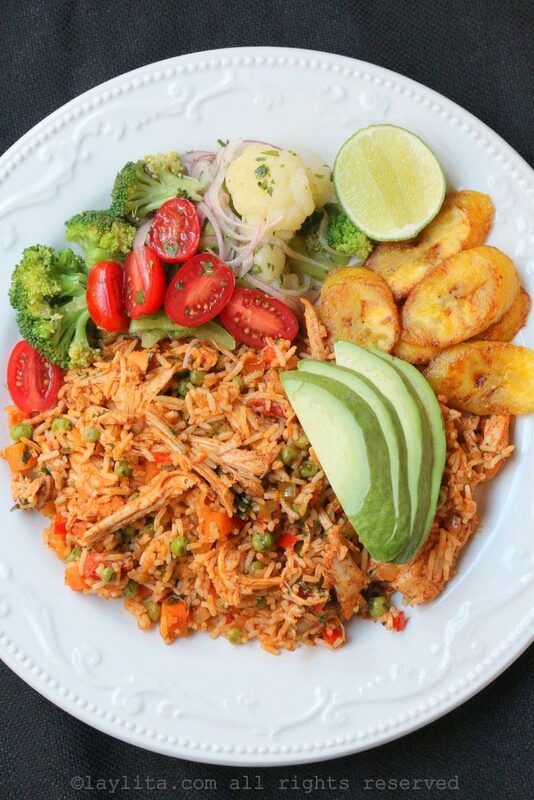 I served this rice with chicken with fried ripe plantains, a broccoli and cauliflower side sad, avocado slices, lemon slices, and hot sauce. Hi Rick – My apologies about that, I just updated the recipe card and it’s now easily printable.